I adore my new jacket! 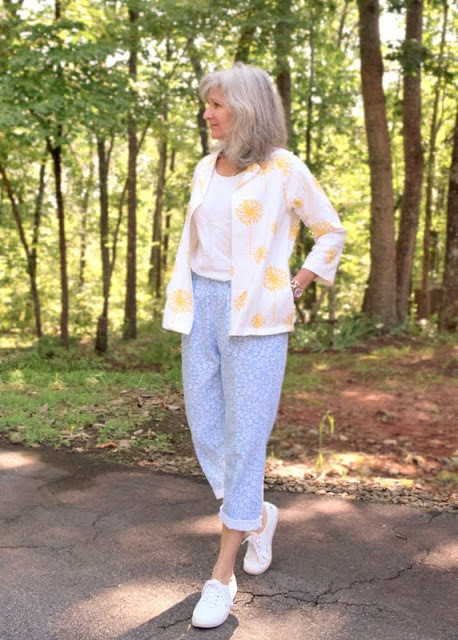 A first for me to make a garment from the Japanese book "Happy Homemade Sew Chic" by Yoshiko Tsukiori, and I enjoyed every single step along the way. This is Pattern N - Jersey Bolero-style Jacket. .....I love the sleeves! They are large enough to house the sleeves of my Rachel Comey Vogue 1247 top easily. Nice! Notice how the wind blows and the inside of my unlined jacket shows? This is why I thought ahead and planned the inside seams to look finished, nice and neat for 'showy' days like this. Thank you oppknits for helping me think that process through! :) I am enjoying instagram much more than I expected and it's a great way to have conversations about project problems with friends who have much more experience than I. This little jacket has a nice 'swing' to it too. Have I said how much I love my new jacket?! I so enjoy looking at all the simple designs in 'Happy Homemade Sew Chic' by Yoshiko Tsukiori and try to imagine what they might look like on me. 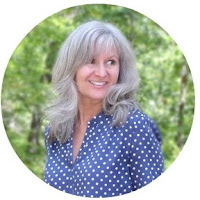 I am 5'7" and not oh-so-thin as her lovely model, so wanting to get a feel for the fit and particulars about Pattern N, Jersey Bolero-style Jacket before cutting anything out, I could only find one other jacket that has been sewn after a quick Google search. This was interesting to me that many others haven't sewn this jacket, as its classic silhouette would work on different figure types and be a go-with-anything type of jacket. Anyway, the pattern pieces were easy to trace and her line drawing(s) and instructions were detailed and easy to follow. If I was stumped, I just studied her drawings and could figure it out from there. This knit, unlined jacket was started March 26, 2015 and completed April 8, 2015. That's pretty quick for me, particularly considering how I went the extra mile in finishing techniques on this project. Even all machine threads were carefully hand-sewn in, not snipped. For some reason, once I began this project, it was important for me to put my absolute best work into it. I learned a few new skills along the way too. The pale-cream, stable knit fabric was purchased off the remnant table at Hancock's Fabrics in Greenville, South Carolina. Don't remember how much it cost, but it wasn't much.... maybe $10-$15 for the piece and there's a lot left over. A size 12 with seam allowances added per the book's instruction was cut. No alterations were made. You can see the pretty sleeves better below. They are flat-sewn in, which I like. Hard to see the inside details..... but shoulder, side and sleeve seams are all flat bound seams per my Threads Sewing Guide book p. 157 using white polyester silk-like lining material for the 1 1/4" binding. Armscythes are left unfinished. I really struggled with how to finish the sleeve and bottom hems. After stitching a sample enclosing the seam with bias binding, determined it made the garment too stiff, and I wanted this jacket to have swing and movement. 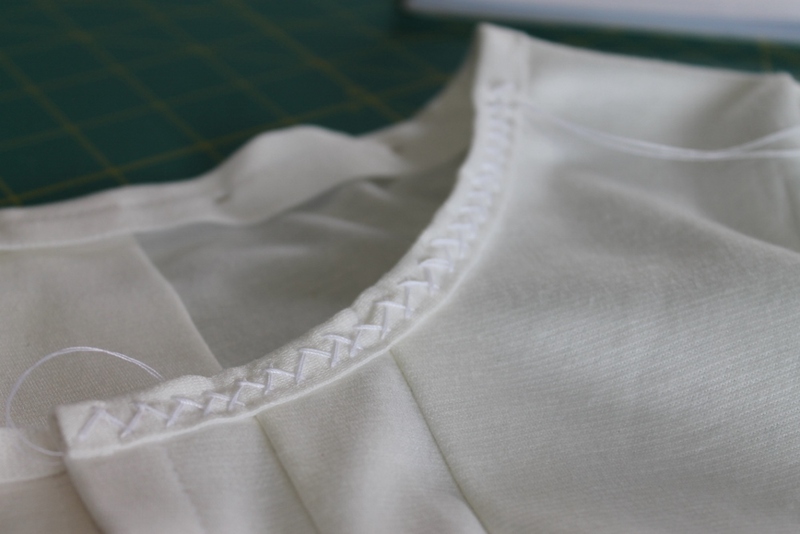 Also, I was afraid it wouldn't 'pleat' where all the pleats are, so decided to simply sew carefully and encase the top of the unfinished edge of the hem with the top of my double-needle. A few of my samples. I sampled everything on this project! 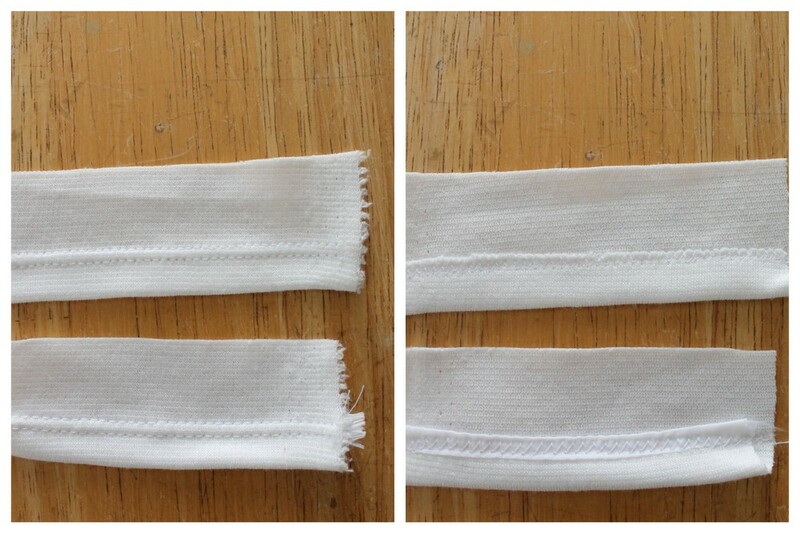 You can see below how much better the hems look double-needle stitched instead of bias bound. Bias binding is on the bottom of each photo. Very stiff. Just a few of my neckline samples, below. The sample to the left represents the book's instruction. For some reason, I was afraid this would make my jacket feel too 'formal' so instead supplemented my Alabama Chanin neckline version using the same technique I'd used on previous knit tops. 1 3/8" strip of knit, cut off-grain in this case (not bias as per the book), overlapped 1/2" to the front of the jacket, stitched with 3/8" seam to the inside for more stability while embroidering. The back seam was left in after embroidering to help with the overall stability of the jacket's neckline. Used double thread of white Button Craft Thread for the herringbone stitch embroidery. The excess binding was cut off the inside (very carefully!) after the embroidering was complete. I decided to cut the binding off grain because there is so much room in this jacket, you don't need to worry about the neckline needing to stretch. In fact, I wanted it stable, and deliberately cut the strips where there would be less stretch. Neckline handstitching in process. It is so much easier to embroider with the binding longer to the inside. Neckline done. The longer inside was cut back to the stitching after embroidering. Sample for flat bound seam using 1 1/4" binding. This is such an easy technique with beautiful, satisfying results. Will definitely be used on future projects. Lisa, this is so pretty-I love all the handwork you used. Truly a labor of love. When I saw the index card, I was surprised and happy-I also use that method to keep notes on patterns, down to the fabric sample. Thank you Mary! Great minds think alike?! What a lovely, versatile jacket! I can't think of a single outfit that it wouldn't go with. Love it, love it. Methinks you are well on your way to becoming a real sewing "pro" who can take any pattern and make it your own. I envy your ability to change things around to suit your own particular style and taste. Really enjoy these posts. Awwww, thank you so much Mama Pea! It's been (and continues to be!) a wonderful, fun, challenging learning experience that I'm glad I chose as a hobby! Loved reading all the details about the construction of this jacket. Those pleats at the neckline are very special and I always love a pleat at the back! Your fabric is a good choice, the cardi drapes so well. I love bias and Hong Kong binding but I've also found it too stiff for many of my blouses. It seems better suited for skirts or jackets in stiffer fabrics or more structured dresses, maybe? I clicked on your photos to see the neck binding better. hehe I clicked to enlarge all your photos, my eyesight isn't so good now and I love to look at the big pictures on my huge 18 inch screen. Every thing is so neatly finished! Oh that neck binding is so interesting! Did you leave the binding edges raw and no machine stitching? Or is it held together by your embroidery stitches? So fascinating! I really like that embroidery, I remember that you used it for a tshirt before. This cardi is really versatile, I can imagine that it can look good both dressed up, city style or dressed down for a casual look. Enjoy your new cardi in your good weather! Thank you so much for all the kind compliments! Thank you ever so much for helping me think through the seam finishes.... particularly the neckline. On the neckline, yes, I left the edges raw, as knit will not fray like a woven, and carefully cut the binding evenly (no jagged scissor cut showing). With this knit fabric so stable, the edges lay down nicely and don't curl. They may curl a little after washing..... we'll see. That would be okay with me as I don't want a 'formal' 'structured' look anyway. The binding is held on to the neckline by 2 ways on this jacket. 1) I left the lengthened (not quite a basting stitch, but almost) machine-sewn straight stitching in that I stitched to the inside of the binding. That not only helped stabilize the work for hand-stitching, but felt, in this case, it helps hold the binding on. Probably could take that out, as I do for my knit tops. 2) the hand-stitched herringbone stitch is quite secure and holds everything together well. In this case I used button craft thread, the type of thread Natalie Chanin suggests using for most of the Alabama Chanin work, but a pretty embroidery floss would be a nice touch too. Understand about enlarging the photos! I actually do the same!!! Thank you again! Very Nice! I'm especially loving what you did with the neckline. Thanks for sharing. Hopefully this will inspire more people to give Yoshiko Tsukiori patterns a try. I hope so too. Her designs are lovely and a joy to sew. Thank you for posting your beautiful jackets! Beautiful - I love all the photographs of your techniques - all the samples are wonderful. The jacket is a credit to you - the AC inspired finish makes this really special. I can't wait to get study over and done with again so I can spend more time on detail, and less on basic sewing! Thank you Sarah Liz! Hope your studies go well and always look forward to seeing what you make!